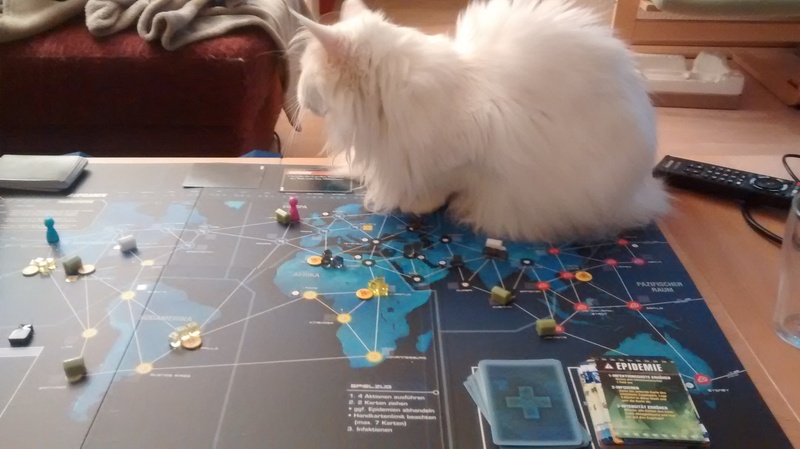 One of my favorite boardgames is Pandemic. I generally love cooperative board games. 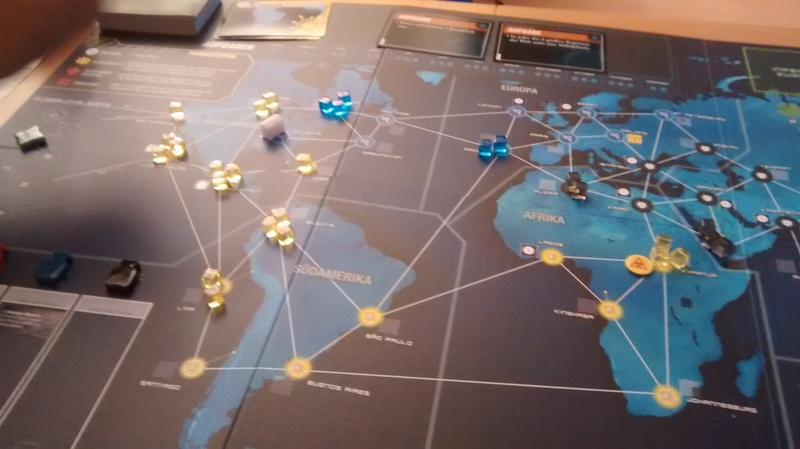 When Pandemic Legacy was released, however, I let it pass me by, just like I never bothered to pick up any expansions to it. An expensive board game that you might possibly only play a dozen times? I didn’t understand the allure. Yet, Pandemic legacy ranks at number 1 board game at Board Game Geek, and was nominated for the prestigious German award Kennerspiel des Jahres. It had to have something. That’s why I gave it to my board game fiend of a spouse for Christmas. We played the first month, and I finally got it. It’s amazing! It doesn’t matter which color box you buy, btw. 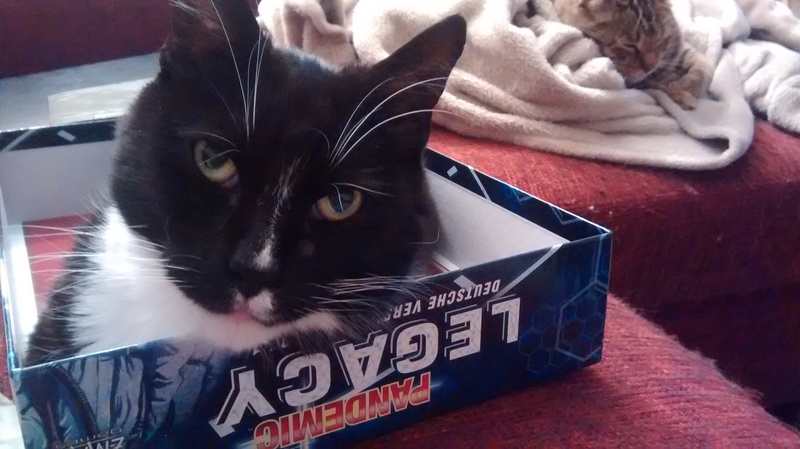 What’s the difference between Pandemic and the Legacy version? Immediately upon opening the box you will notice a number of things that are different. Sheets of stickers, secret dossiers with letters and numbers on them, 8 black boxes with who knows what inside and much much much room for new rule additions in the rulebook. Additionally, you get a stack of Legacy cards. In Legacy you play a campaign, and Pandemic with a real plot is revolutionary. The plot stretches over a year. You start with January and get two tries to beat the objective of the month. This means that with 2 tries per month, the maximum amount of times you will play this game is 24, before the campaign ends. The adjustment of the difficulty level is genius. You start with a funding level of 4, meaning you get to pick your choice of 4 event cards to be shuffled into the deck for drawing. Each time you win, your funding level goes down by 2. Each time you lose, your funding level goes up by 2. After each round, no matter if you lose or win, you pick 2 permanent upgrades. You improve your character, have positive mutations to your diseases, permanent science centers, etc. The first month starts out like every other Pandemic game, just with different jobs available, and you can name the characters. I am playing the medic. His name is Harry Petersen, he’s from Hamburg, and out to eradicate all diseases in the world. The game changes quickly, however. After the second epidemic you have to draw a Legacy card, and the game changes. Legacy cards will include narrative, and then instructions what to do. Open dossiers, draw more cards, until you get to the next Legacy card in the stack, etc. Opening dossiers and seeing all the new stuff is incredibly fun. Our first game did not go so great. We won by the skin of our teeth in the first try, but it was super-close. We had a total of 7 out of 8 possible outbreaks. In Legacy, cities that had an outbreak receive a sticker indicating their status. The higher the level of unrest, the more dire the consequences. Airports close, science centers get burnt down, and in the worst case the city is completely destroyed. So, good job us, 7 unstable cities in one go. We’re currently stuck with two cities at level 2, Los Angeles and Milan. Oy! Once you successfully meet the objectives of a month, you get an advantage in the following month, which is cool. Starting from month 2, you get your first rule changes that you really do not know from the base game. Currently, we always play the mission matching the current month, just happened that way. On Sunday we finally had time to tackle March. We were expecting March to be tough. We beat both January and February first try and so had a funding level of 0. Also, the board shows how many objectives you have to meet. March is the first month with two objectives. I mentioned above how much I like the difficulty adjustments. We were able to pick 2 permanent upgrades after try 1, and our funding level went up to 2. After picking 2 nice event cards we braved it again. Huzzah, we managed both objectives very successfully, plus we only had a single outbreak. A turn before our victory, Mo had to join us. March added another mechanic, and a new character, which we didn’t use. We currently are using medic and quaratine specialist, and that works pretty well. I am looking forward to our April game, where we might possibly have a guest player. It’s going to be grand. Even my cat can’t believe it, I am shredding cards. The toughest moment of each game is when Legacy tells you to destroy cards. It really requires something to actually go ahead with it. In Legacy, the characters may die, and you’re supposed to rip up the cards. I am not sure I could, if Harry ever dies! 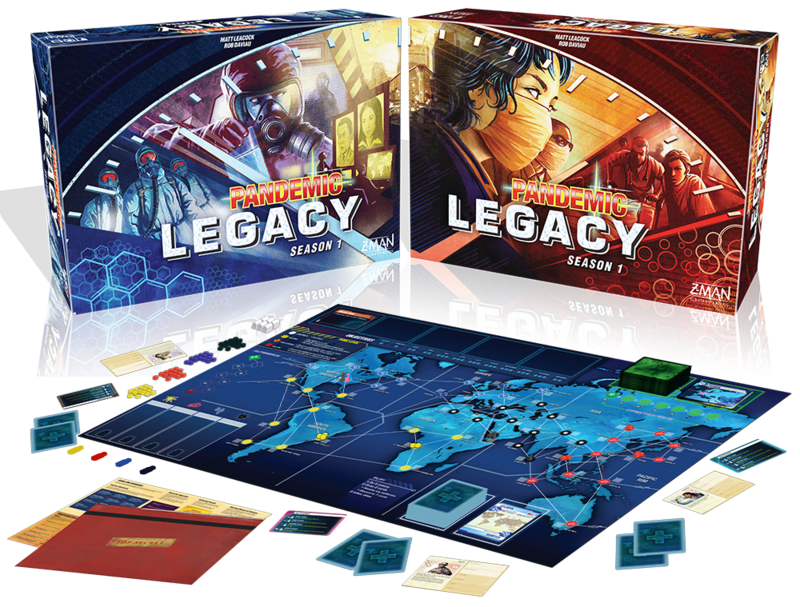 One thing is sure, once Pandemic Legacy Season 2 is released and we have finished the first season, it will be a mandatory purchase. It’s really the best coop game I could imagine. It should have won Kennerspiel des Jahres. The actual winner, Isle of Skye is very good, but it’s just a Carcassonne variant with flexible victory conditions and a bid mechanism. It doesn’t really bring much new to the table. That’s IMHO, of course. To finish this off, here’s some bonus kitties, because they also seem to enjoy this game. Yes, he’s a big derp.